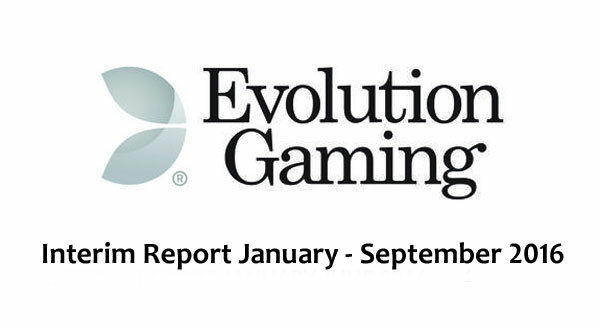 Evolution continue to publish impressive results with a third quarter increase on revenues of 47%. That’s a profit of €7.4 euros. 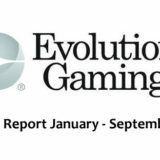 Live Casino continues to gain ground both in terms of strategic significance for operators and popularity with end-users, and we were therefore able to record yet another quarter of strong growth. Sales rose by 47 percent compared with the year-earlier period. It is also encouraging to see that we grew compared to the previous quarter, despite the third quarter historically being a weaker period. EBITDA amounted to EUR 10.8 million, corresponding to a margin of 37 percent. The strong demand for tables and environments continues to drive investments, hence exerting some pressure on the margin. 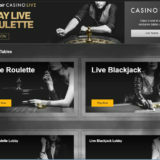 The largest investment of the quarter is the new Live Casino studio launched at the Grand Casino in Bucharest, Romania. Through this, our seventh studio, we are the first certified Live Casino supplier in Romania and together with our local partner iSoftBet, will deliver a world-class service for operators looking to enter the market. Regulated markets is one of our core areas, with the aim of further widening the lead over other suppliers and laying a solid foundation for continued growth. In this quarter we saw a big breakthrough for our land-based business through the launch of Dual Play Roulette for the world-famous casino operators The Ritz Club and The Hippodrome respectively in London. I am proud that two brands of such strength have chosen to go live with us. It clearly proves the trend of the land-based casino sector beginning to migrate online, even though we have only scratched the surface so far. It is also satisfying to see that this not only applies to the UK – in this quarter, we have also signed an agreement with Olympic Entertainment Group, a market-leading gaming supplier in the Baltics, with casinos in several European countries. We also continue to increase the gap to our competitors in regards of products. We recently launched Live Ultimate Texas Hold’em to a number of customers, and the roll-out continues during the autumn. Evolution owns the exclusive rights to offer a live version of this game globally via our partner, Scientific Games. 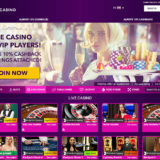 The popularity of poker games is increasing fast, and to deliver a grand experience we have opened an environment created exclusively for our range of poker games, from where we are now streaming Caribbean Stud Poker, Casino Hold’em, Three Card Poker and the aforementioned Ultimate Texas Hold’em. 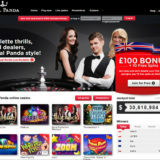 As in the last quarter, demand for new dedicated tables and environments is very high; among the latest launches are Mr Green, Tempobet, Marathonbet and Royal Panda. Marathonbet is particularly distinctive, as they have a new Roulette table that has been customised to reflect the brand of one of Britain’s most prominent Premier League clubs. The inauguration of the table was a grand affair, with a visit from some of the club’s iconic players to our studio in Riga. In order to best meet the strong growth, on 1 November we are making some changes to the board and management, where I have been appointed Executive Chairman, Martin Carlesund moves upwards to the role of Group CEO and newly-employed Johan Nordström becomes CEO of Evolution Malta. Since the IPO, I and Martin have worked together to create an organisation and a team that can take Evolution to the next level. Having the right people is crucial – we now have a team in place which under the management of Martin can maximise the pace towards a position in the market that no one else can reach. As Executive Chairman, I will not work less, just have a different focus. I would like to thank our current Chairman Joel Citron for an excellent service as Chairman during the expansive period we have experienced. Joel will remain as a member of the board, focusing among other things on governance issues. Through the change in leadership, this will be the last CEO comment that I write and it feels good to note that with less than three months left of 2016, we will be able to sum up yet another record year for Evolution. We have experienced an exceptionally high level of demand for our services, which has put our delivery capability to the test. Time and again we have succeeded in supplying advanced and pioneering solutions, both in our own studios and to our customers. 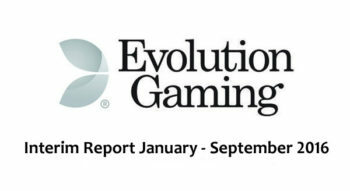 This has also paved the way for sustained growth and a leading position on the Live Casino market.